Bulbs Arkofluide DIGESTIVE COMFORT BIO LABORATORIES Arkopharma are food supplements that energize and stimulate digestion to find a digestive comfort, but also intestinal. Poor digestion and poor transit may be responsible for many ailments such as bloating, formation of intestinal gas, colic, heartburn ... Who are manifested in everyday moments and spoil the meal should be rather a source of pleasures. The cause often lies in the quality and composition of the menus too poor in fiber, which are the number one players, good transit and a sustainable peace. This vegetable can drain the liver and gallbladder, it is very rich in fiber, which significantly improves intestinal transit, particularly effective on constipation. The artichoke has a rich dietary fiber involved favorably on intestinal transit, artichoke prevents the risk of constipation and cardiovascular diseases. Rosemary stimulates the functioning of the gallbladder and soothes the digestive spasms. It enhances the feeling of bloating and heaviness. This plant helps neutralize bloating, flatulence and digestive spasms while facilitating proper digestion of food consumed. 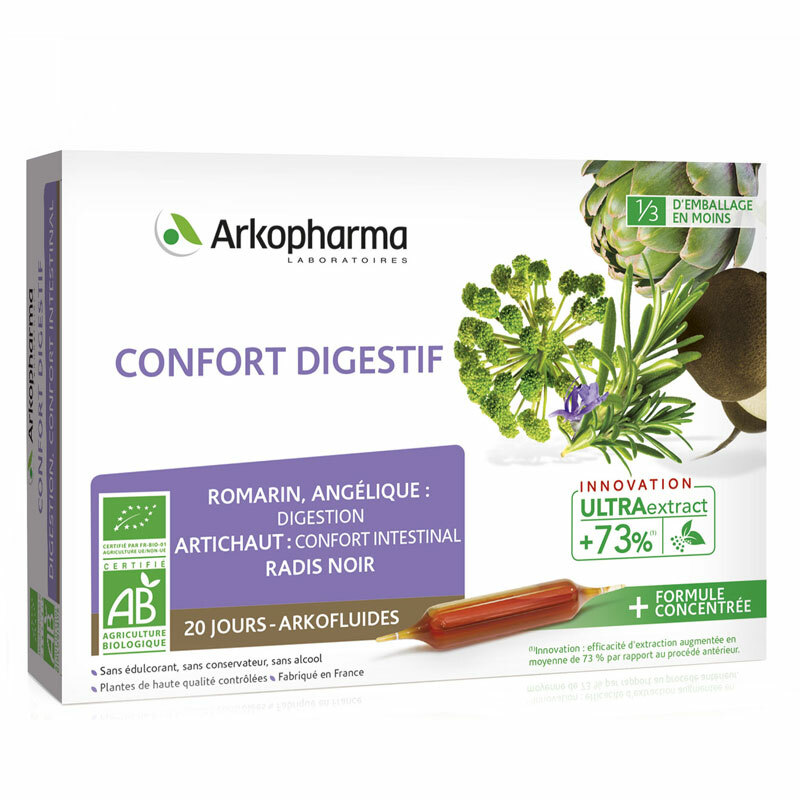 Bulbs Arkofluide DIGESTION BIO LABORATORIES Arkopharma, will allow us to find all the pleasures of the table by acting on good digestion and a significant improvement in intestinal transit. Your belly is light, flexible and irritating symptoms of digestion gradually disappear. Shake vigorously bulb before break ends. Pour the contents into a half glass of water, stir and drink. Are dietary supplements and does not replace a varied and balanced diet coupled with a healthy lifestyle.